Wigan delivered a solid victory over a Catalan Dragons side who maintained neither quality nor discipline amidst the muddy ruin of the pitch. For all that the conditions were atrocious, with the pitch visibly watterlogged in places, Wigan’s quality and drive were simply too much for the Catalans, whose poor performance effectively gifted the first half of the game to the Warriors. While there was great effort by individual Catalan players in the opening minutes of the match, including Christian Inu, and former Wigan star Pat Richards, the team as a whole simply lacked the cohesion to match a Wigan side firmly in their element, and the Warriors dominated the opening stages of the game. As Wigan pressed home their advantage it was only a matter of time before they scored and Michael McIlorum pushed over the line in the fourteenth minute, though Matty Smith hit the goal posts on his conversion attempt. Not that it mattered. McIlorum’s try was followed by another in quick succession three minutes later, right between the posts. This time Smith’s kick proved truer than his first attempt and the prospect of a whitewash seemed likely. Fortunately for Catalan, these were not the conditions for such a drubbing, but play this poor in dry conditions will see them humiliated in future games. Instead Wigan played good solid Rugby designed more to keep the ball in their possession as the rain continued its unrelenting downpour. 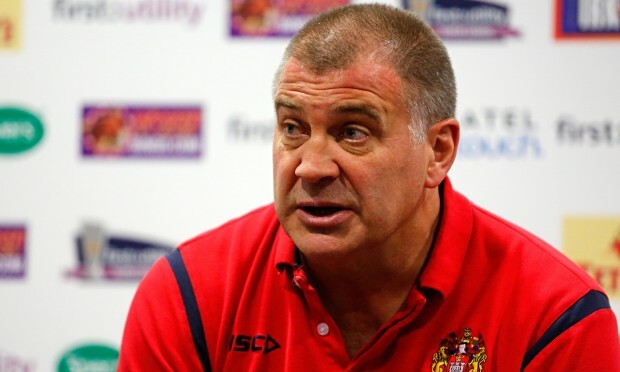 This wasn’t to say Wigan’s players didn’t make mistakes or lose the ball; they simply did it less than the Catalans did. As the game moved into the last ten minutes of the first half, Catalan improved slightly and looked, briefly as if they might score. Then a minute before half time they squandered two golden opportunities, with Pelissier making a poor attempt at a dummy move that fooled none of the four Wigan players opposite. Then when Wigan gave away a penalty almost in front of their own try line, Catalan went for the same Death or Glory approach Leeds showed last night. With the same result. Instead of a safe two points from a kick, they got nothing as it was simply too wet for glory. That lesson was hammered home during the half time period and when Catalan came back on the pitch for the last forty minutes their quality was far superior and it showed. Only a minute into play, Justin Horo scored a try by the narrowest of margins, with his fingers grounding the ball before Lewis Tierney’s kick could stop him. Pat Richards showed his kicking was still formidable and now Catalans could almost smell the possibility of an upset. Wigan are not Leeds however, and the discipline of the Catalan players once again let down their valiant resurgence. A superb breakout by Sean O’Loughlin was stopped only by a disgusting high tackle from Gregory Mounis, who was lucky to escape with the penalty that followed, and not a trip to the sin bin. Worse for Catalans, the next time they gave away a penalty was close enough to their try line that Wigan went for that safe two points, extending their lead to twelve points against Catalan’s six. And there it remained with two further tries by Wigan disallowed. The first of these will be hotly debated by Wigan fans as, whatever the Video Ref might have ruled, there was neither a clear example of a forward pass nor of a knock on, and a try was deserved. The second however was clearly not a try after Josh Charnley pushed his Catalan opponent to the ground. Not that Charnley has anything to worry about, for his conduct was nothing compared to that of Dave Taylor. The Australian clearly struggled to keep his temper in check, resulting in the ball being lost far too often. Given his experience in the NRL, Taylor should have been helping to see his Catalan teammates through conditions they clearly weren’t prepared for. Instead he hindered more than helped and if any of the other experienced players Catalan had on offer were going to be calming influences, they failed to make their mark tonight. So Wigan emerged the victors, which, for all it may not have been flashy Rugby, still gets them the points and Catalan nothing. As was deserved. If underdogs mounting a comeback and being cruelly cheated by time was the story you were looking for, both Huddersfield and Salford may have offered better fare. At one point it looked as if each would be massacred by their respective opponents, St Helens and Hull, with scorelines that seemed to get bigger margins between the two sides each time an update came through. In the end though both Huddersfield and Salford managed to rally a little, clawing the scores back to the point where their matches ended in respectable defeats, with St Helens beating Huddersfield 30 points to 16, and Salford going down 20 points against Hull’s 42.